Connecticut Governor M. Jodi Rell speaks during an interview in her office at the Capitol in Hartford, Conn.
Gov. 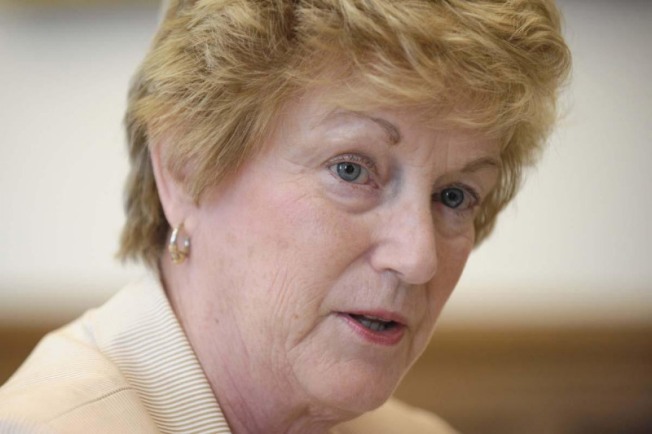 M. Jodi Rell is inviting New Yorkers who may feel overtaxed to move next door to Connecticut. Rell sent a letter Wednesday to Timothy Selby, president of the New York Hedge Fund Roundtable, inviting him and other hedge fund managers to relocate. The governor is wooing wealthy New Yorkers after that state's legislature said it will tax hedge fund managers to help raise $50 million. New York City Mayor Michael Bloomberg said Albany's plan would help Connecticut, and Rell hopes the billionaire mayor is right. She told Selby that state economic development professionals will help find offices, homes and schools. Rell also praised what she called Connecticut's more enlightened approach to job creation. The hedge fund roundtable did not immediately respond to a request for comment. Mayor Bloomberg was angered by the New York state Legislature's plan to tax hedge fund managers to raise $50 million. It's part of a fiscal plan, which could potentially be vetoed by Gov. David Paterson, that would also tap the rich by reducing the state tax deduction for charitable giving and delaying some business tax credits. "I think it's the best thing that ever happened to Connecticut," Bloomberg said. "I can't imagine why every hedge fund wouldn't pick up tomorrow and move," the independent mayor said of lucrative investment groups used by the wealthy. Assembly Speaker Sheldon Silver, a Manhattan Democrat, said he told Bloomberg that taxes and fees raised in the budget and felt by the wealthy are unavoidable in a fiscal crisis and when the state faces a $9.2 billion deficit. "I told him it's a temporary situation, he understands that," Silver said Albany. "We need revenue in this state. He's complaining about some of the cuts we made to the city. We try to do a balance so we can provide some things and cut some things, and that's what it's about." "The first commonsense rule of taxation is, 'Don't tax people that can leave,'" Bloomberg said in his news conference in New York City. "Hedge funds are a bunch of desks with terminals on them — they can be anyplace. We've lost a lot of business to Connecticut — this will just send more of them." The measure is projected to raise $50 million for the state. The loss of half the state's charitable contribution credit is projected to raise $100 million and would hit New Yorkers making $10 million a year. it would sunset in 2012. The Assembly is scheduled to give final legislative approval to the budget on Thursday. It will include more than $5 billion in cuts. The total budget is nearly $136 billion. The city will lose millions in aid to municipalities and school aid in a state budget that cuts both funds for schools and local government statewide.